You are here: Home › Blog › Here is the SolidWorks tutorials Slots/Rod in text format. Here is a text run-down with images of one of the videos I’d posted earlier this week (just click here to see the SolidWorks video if you want to watch it). Hmmm. That kind of sounds dirty but the SolidWorks tutorials definitely aren’t! I get about a few dozen “how to” questions for custom SolidWorks tutorials, Inventor tutorials, CATIA tutorials and more each day. While unfortunately I can’t answer all of the questions, as I’m running a business and raising young kids, I try to get to a few of these a month, and then post a tutorial about them. So it’s a win-win, since I get some advertising for my SolidWorks training and you get some free SolidWorks tutorials! Yes, I can help. I liked this question because the errors you run into here are common and once you get this trick under your belt you can avoid running into this annoying roadblock. 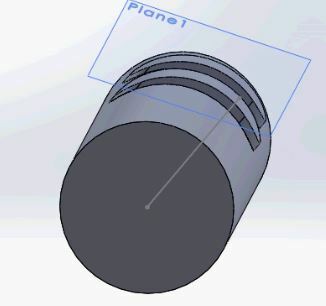 This is something I always try to plug into my SolidWorks tutorials; some tips about how you can avoid common modeling errors. First we need to build a rod. 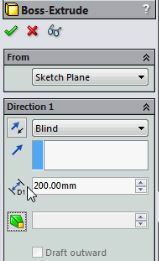 I’ll create a new sketch on the front plane with a right-click, then select the Sketch icon. 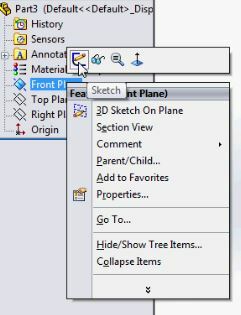 Figure 1 – Right-click on the front plane and select Sketch. Next, activate the Circle Tool and draw a circle in the graphic area. We don’t need to dimension it for this example, so just click Accept & Exit in the confirmation corner. Figure 3 – Click Accept & Exit. On the Features tab, activate the Extruded Boss/Base command. Figure 4 – The extruded boss/base command. For this example we’ll accept all default parameters, and just enter a depth value. I’ll plug in 200mm, and then click Accept. Figure 5 – The boss-extrude property manager. 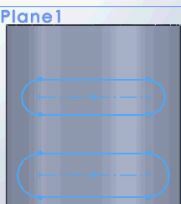 The next thing I’ll do is create a support plane, on which I’ll sketch the slots. From the Reference Geometry menu, select Plane. Figure 6 – Create a support plane. My reference plane will be the Top Plane. I am going to offset my new plane by 60mm from the Top Plane. Figure 7 – offset the new plane from the top plane. Now I’m going to create a new sketch on my new plane. Right-click on the new plane and select the New Sketch icon. Figure 8 – place a new sketch on the new plane. Then, I’ll take a Normal To view; select it from the View Selector submenu. Figure 9 – the View Selector. I’m hovering over the “normal to” tool. Figure 10 – here’s our model in “normal to” view. Activate the fun new Slot Tool command. We’re going to insert two slots for this example. Of the four slot methods–there are four sub tools for slot now–I’m going to select the Centerpoint Straight Slot command. 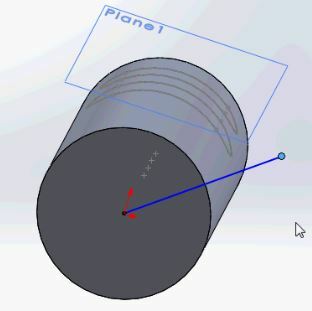 Figure 10b – the new Slot tool in Solidworks – centerpoint straight slot is one of four subtools. To use this tool, your first click establishes the center of the slot, and your next click the length. The third click sets the width. Easy, presto. Place the slots on the cylindrical surface, and then accept and exit the sketch by clicking on the checkmark in the confirmation corner. Figure 12 – two slots, after we’ve accepted the sketch and are in Part Modeling mode. Now, I’ll take an isometric view. Figure 13 – Isometric view from the View selector. Figure 14 – our model in Isometric view. You can see our slots on Plane 1. Let’s try to use the Project Curve command. (This is going to result in an error message, but let’s try it out, since this is a common error). Activate the Project Curve command. Figure 15 the Project Curves tool is a Curve subtool. 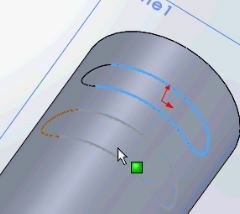 Then I’ll select the cylindrical surface, and click ok. Figure 16 – The Projected Curve property manager. 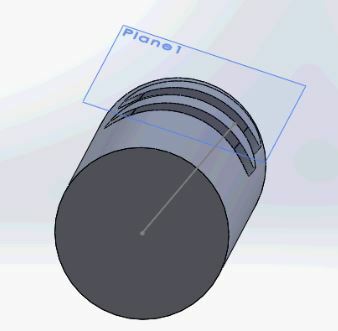 SolidWorks tutorials – Cylinder not suitable to project. Figure 17 – the Rebuild Error when we try to project the curve with current settings. Let’s cancel out of the Projected Curve property manager. Figure 18 – Click the red X to exit the Project Curve tool without accepting the feature. 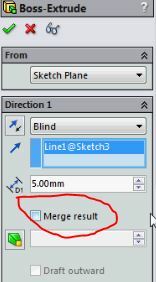 Let’s fly out the Curves subtool menu by clicking the downward-pointing arrow, and select the Split Line tool. 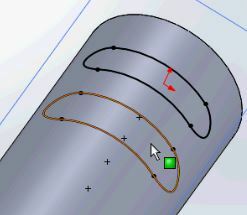 Fig 19 – The split line tool, one of the Curve subtools. When the property manager opens, we see that sketch 2 is already preselected. Figure 20 – The Split Line tool property manager, with Sketch 2 (the slots) preselected. Let’s use the Projection type of split. 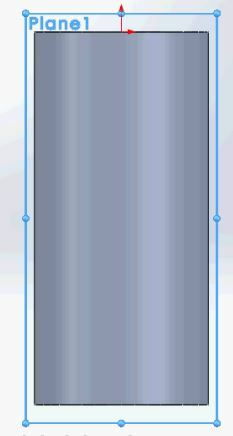 Now, click in the blue selection window to activate it, and select the cylindrical face right in the graphic area. 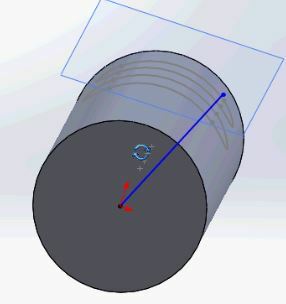 Figure 21 – Select the cylindrical face in the graphic area. Then click accept. From here we can create a 3D sketch. Let’s go to the Sketch tab, and select the 3D sketch subtool from the Sketch drop down menu. 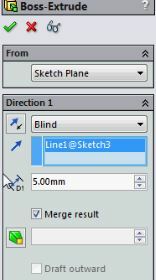 Figure 22 – the 3D sketch subtool, from the Sketch command menu. With the 3D sketch now open, let’s activate the Convert Entities tool. Figure 23 – Here’s the Convert Entities tool, on the Sketch tab. Then I’ll select all the edges that comprise both slots–so each slot has four edges to select. Figures 23 & 24: selecting our slot edges; the edges populate in the Entities to Convert field. Now we have a 3D sketch. Figure 25 – our 3D Sketch. Next, I’ll create a direction vector. We’ll do it on a new sketch, and we’ll place that new sketch on the circular face of the rod. 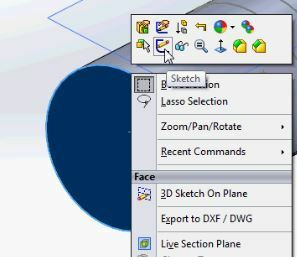 Right click on the circular face and select Sketch. Figure 26 – creating a sketch to use as a direction vector. 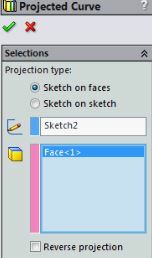 Figure 27 – the line tool on the Sketch tab. Then place a line about 15 degrees off of vertical. Figure 28 – here is the direction vector. Press Escape to exit the Line Tool. In a situation like this, if the line angle is too large, say closer to 90 degrees, that’s not going to work. You will have problems extruding because the extruded surface and the solid will self-intersect. So watch out for that. Figure 29 – too big an angle! Accept and exit our sketch. Let’s get back to the Features tab. Activate the Extruded Boss/Base command. 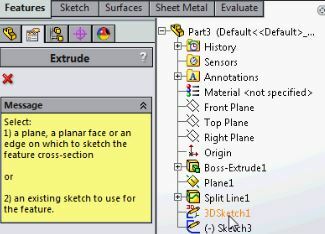 Figure 30 – Features tab, Extruded Boss/Base command. Then, select the vector; that’s the line we created in the previous sketch, as shown below. 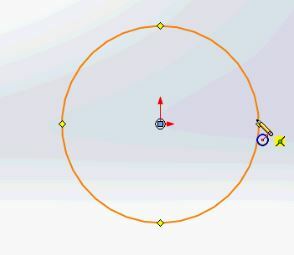 Figure 31 – Using the direction vector for our extrusion. Figure 31b – The boss-extrude property manager. After we press TAB to register the preview for this dimension, we get a rebuild error message: “Unable to create this feature because it would result in zero-thickness geometry.” This is the second common error I mentioned at the beginning of this tutorial. So how can we solve this problem? 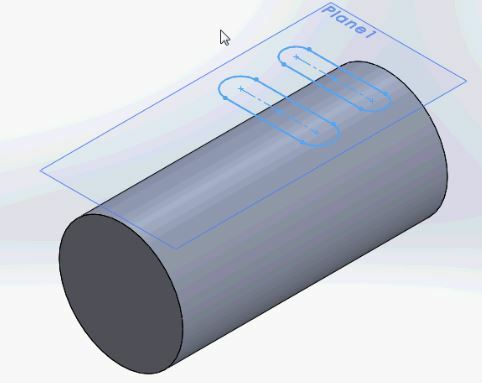 Well, SolidWorks can’t merge these two solids. So, let’s opt for two unique solids by unchecking Merge Results in the property manager. 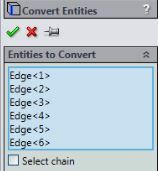 Figure 33 – Uncheck merge result on the Boss-Extrude property manager. Figure 34 – Our finished model. Another option would be to extrude in a second direction. Let’s open the extrude for editing. Right click on the part and select Edit. Figure 35 – Right-click, Edit Feature. Activate the section for Direction 2 by checking its box. Figure 36 – Direction 2 – check the box in the title line to activate this area. Let’s enter a distance for the second extrusion direction of 0.5mm. Press TAB to register. Don’t forget to check Merge Result. Click accept. Here is our finished model! 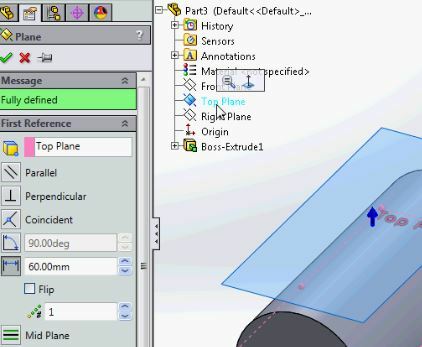 Solidworks tutorials – a second method of creating the finished model. Success! Figure 38 – Success! Here is our completed model, with the slots extruded 0.5mm. Thanks! This concludes this SolidWorks Tutorials Questions & Answers segment. See you back in our next one.